Here you can see the RED paint before, I used to dig that color. Funny how taste changes over the years! The cute little gray baskets hanging from the towel bar are from IKEA. I actually put some tiny battery operated twinkle lights into one of them. 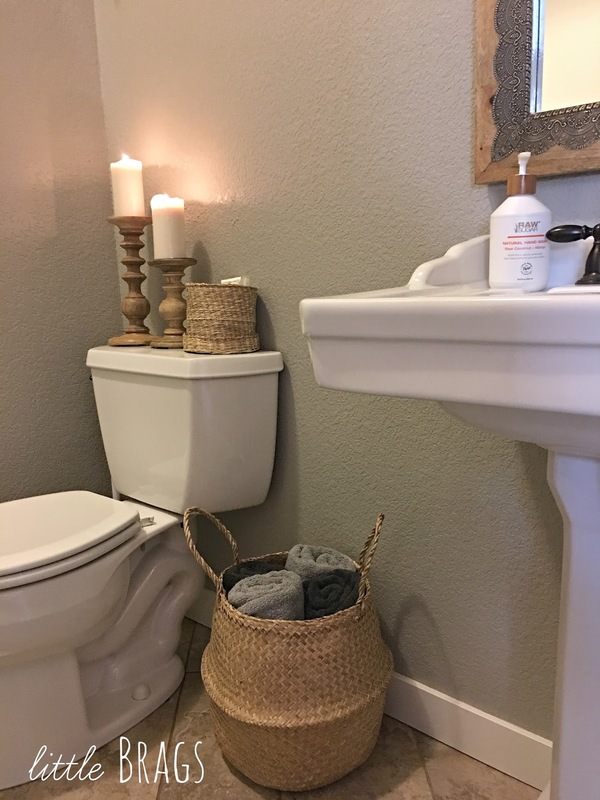 basket on the toilet holding the lotions. 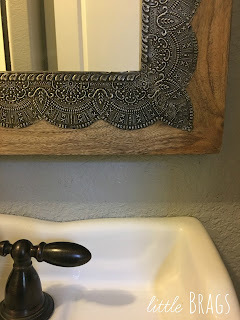 The gorgeous new mirror is from Worldmarket. I love the look, it's so Moroccan! 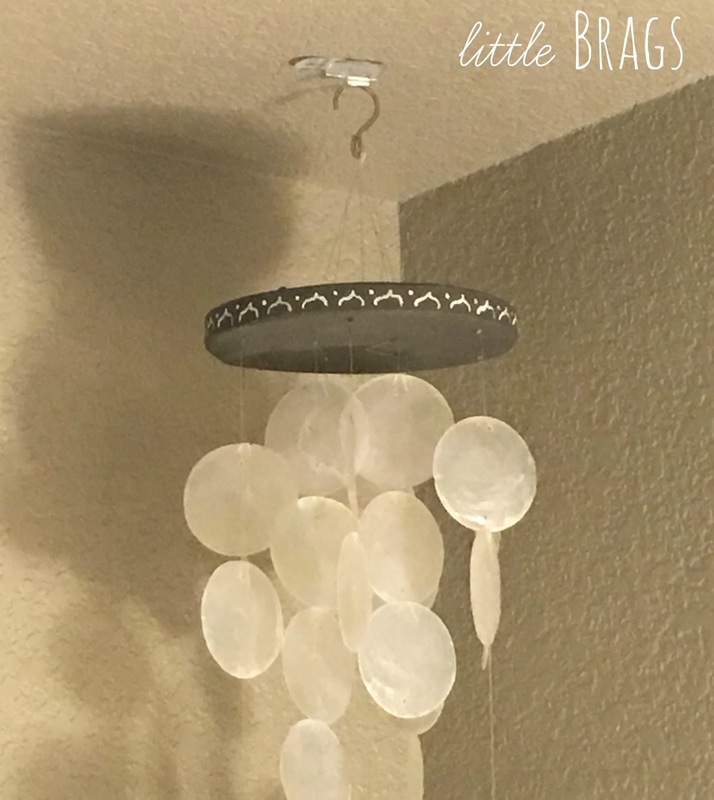 I got this little capiz shell wind-chime at our local Garden Center/Nursery, but I painted the top with Annie Sloan Graphite and painted a tiny Moroccan design around it, so it would go better with the look I am going for. the walls, but I sure love how it's coming along! 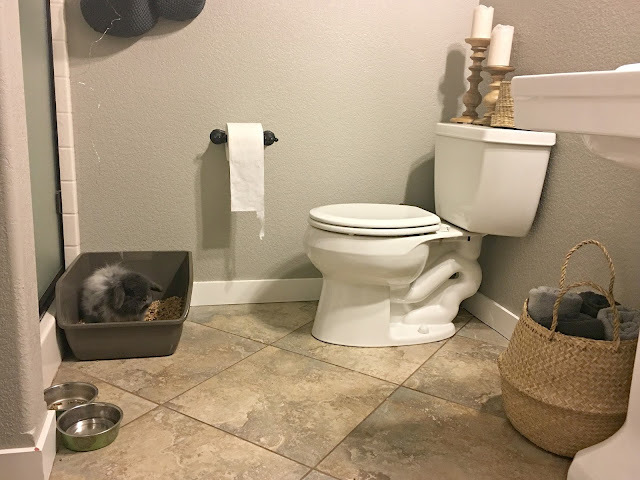 the powder room before some-bunny get's upset! Yup that's right, no messing with Bugsy's toilet! Ain't he just the cutest? Thanks so much for stopping by! Ja onze smaken veranderen per jaar. Soms denk ik hier doe ik een tijd mee. Maar in de praktijk is dat anders. En hup weer verf erop. Wat gezellige dat je konijn ook daar zijn plaatsje heeft. Love the update! 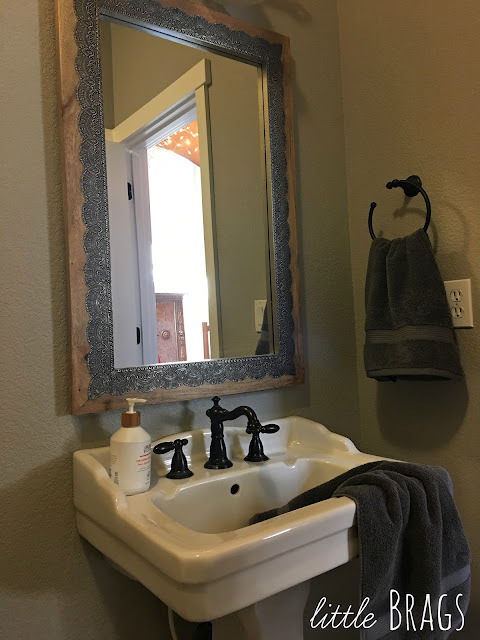 And that mirror is gorgeous! Funny, I just finished a mini-makeover of my loo in the master yesterday, will share it on the blog later on the week! That little sweet bunny is the cutest. I love when you share him with us. Thanks and have a great day. It looks so much better. 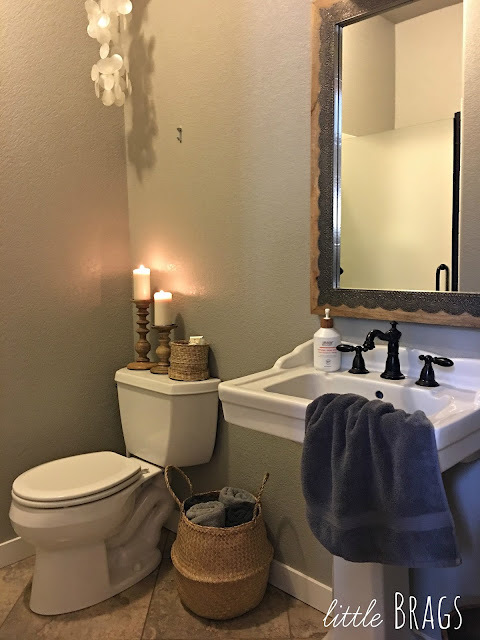 It's funny how our taste change...I used to have a hunter green bathroom. Yuck now. Lol. Bugsy is too cute! I LOVE the new color AND the decor!!! I saw someone else using Mindful Grey recently, it's such a calming color! 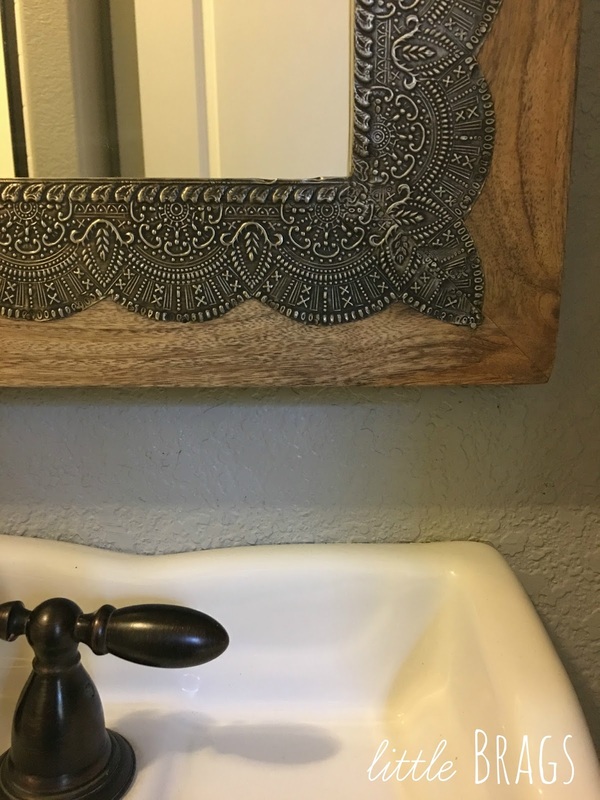 The mirror is beautiful, too. And, of course, you can't mess with Bugsy's amenities! A really beautiful update. I really love the new paint and baskets and it's all Bugsy approved! Bugsy is adorable! 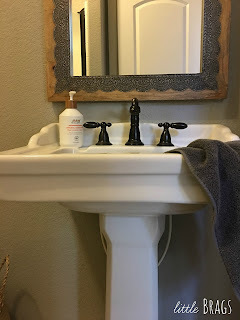 The new look in your bathroom is fab! So pretty! 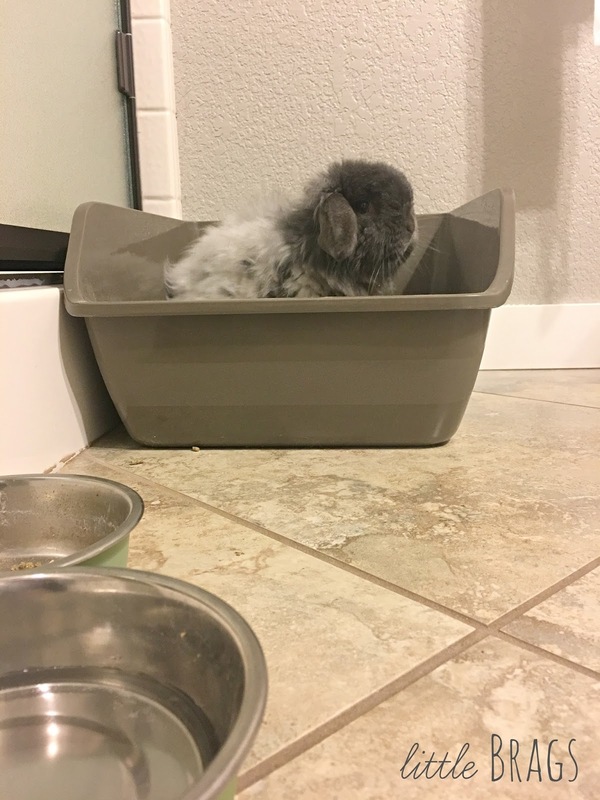 I also think it is very cool that your bunny is box trained! I like that color very much and the mirror is beautiful!! Good job! 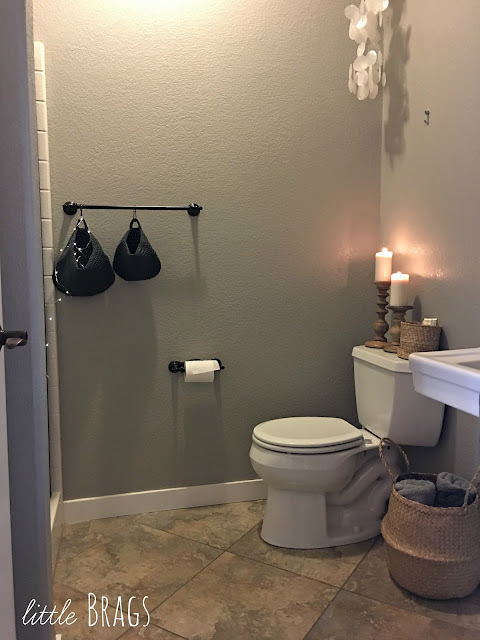 Hi Christine, your bathroom update looks so nice! I love the new color! It is so fresh! 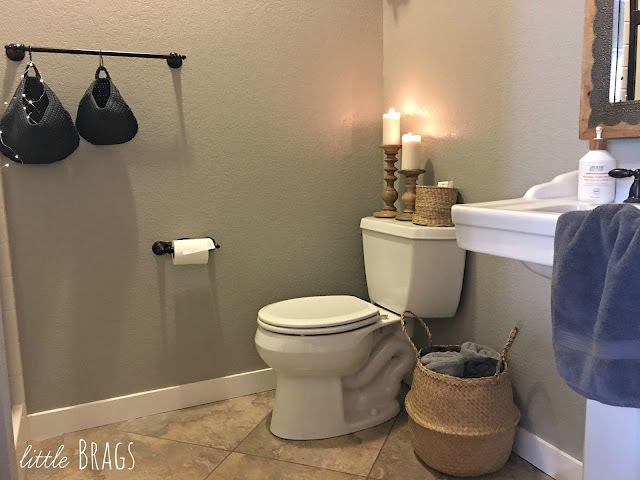 I am lucky I just got to buy new rugs for my master bath! 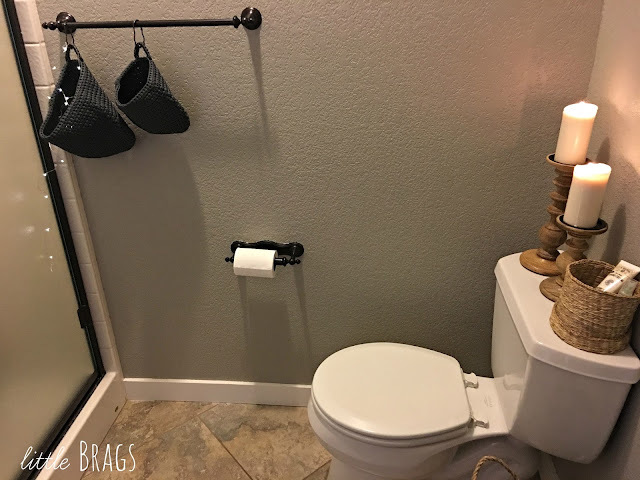 I look forward to the day I can really upgrade these builder's grade bathrooms! Piękna łazienka, bardzo fajna metamorfoza, IKEA okazała się bardzo pomocna. Zdradzę Ci w tajemnicy, że kocham IKEA.ustrp jest wspaniałe. Podziwiam!!! Bugsy is a good sport and cute as can be. I love your updates and that mirror just made it's way onto my must have list. Thank you for sharing with us this week at Celebrate Your Story, have a great week. 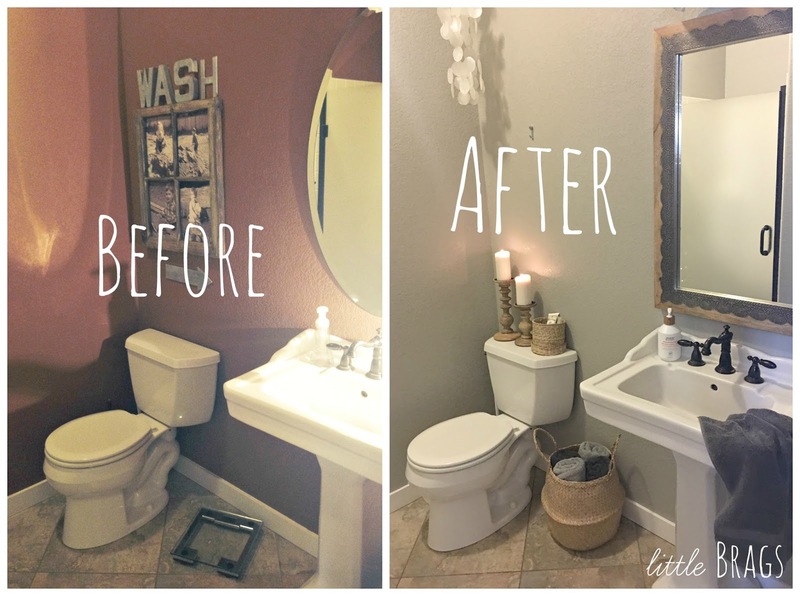 Such a lovely makeover. Everything looks so great together. And little Bugsy is adorable. The rabbit is so adorable. Your update looks fresh and modern. Love the new paint color Christine! 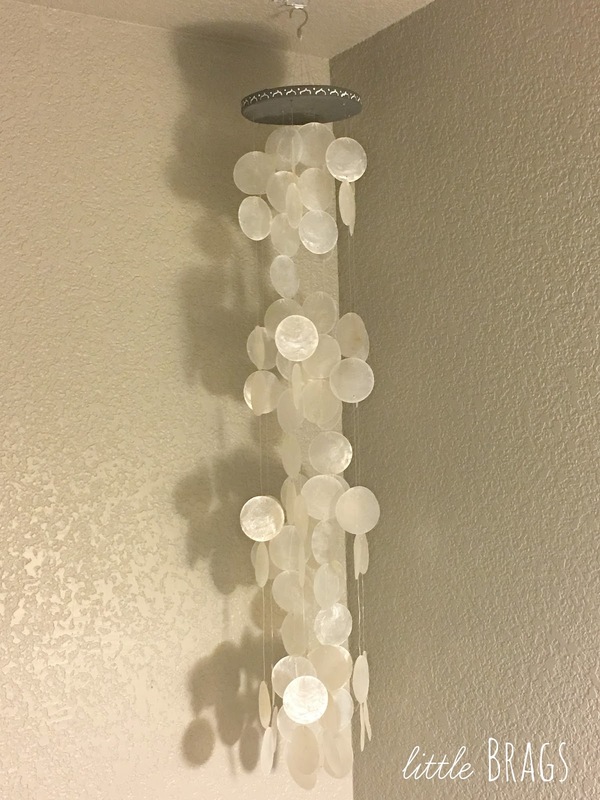 It really freshened up the room. Bugsy is always so cute!! Thanks for sharing with SYC. I can never get over Bugsy, he's such a cutie patootie! I can not let our bunnies inside, because they just nibble on everything, doesn't he do that?? Ours are outside in the garden and believe me part of it is an underground maze because they won't stop diggin! Love your powder room Christine, sieht super super schoen aus, die kleinen Lichter in den Haengekoerbchen sind so so schoen! Love it all! Perfect. It is a wonderful transformation. It's looking great Christine! 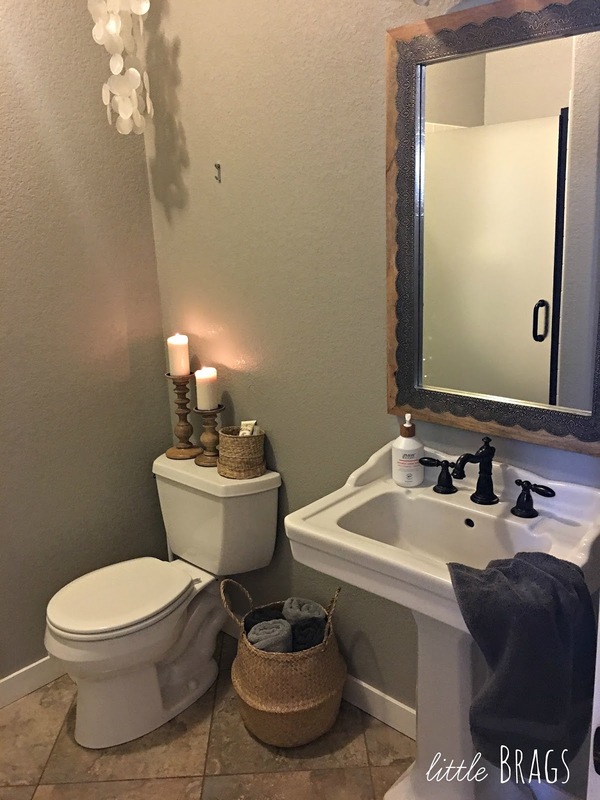 I LOVE the baskets and that mirror! Bugsy is adorable... even when he is using the toilet!! The color change is lovely Christine and that mirror, Wowza, anything morrocan is just perfect, just like Bugsy. We also went through a red/maroon phase a while ago, LOL. It must be one of the most difficult colors to paint over. Layers and layers of paint just to hide the color. Hey, we're woman and we're allowed to change our minds as often as we want to. It looks lovely Christine! Thanks for sharing at Home Sweet Home! Cutest bunny in blogworld! 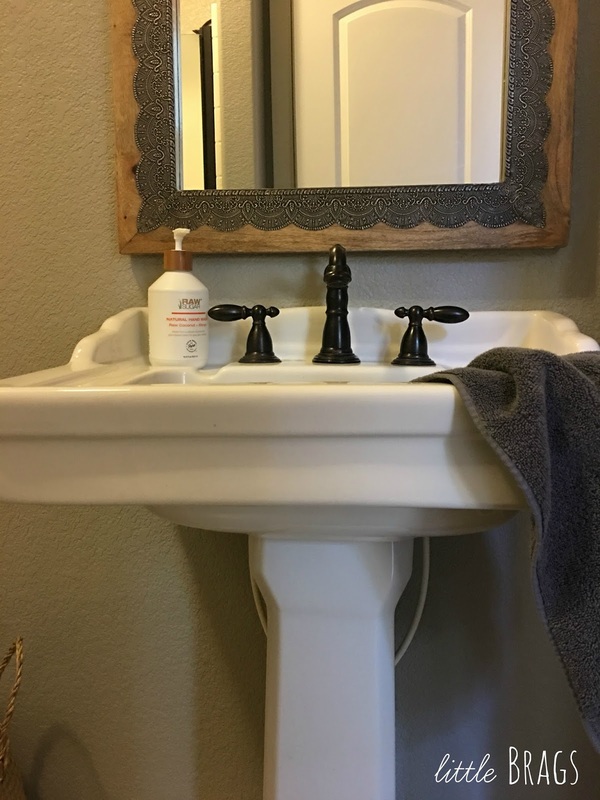 Love the changes in your bathroom, Christine! 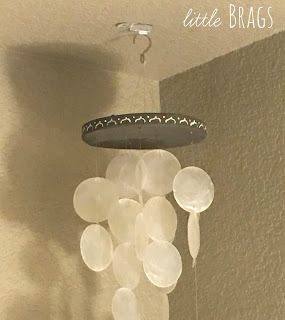 If you have a sec, and you feel like sharing it at our party in my blog, I'd love it if you would :) Enjoy your week friend! What a fabulous, bright and cheery update Christine. Well done!! Thank you for sharing at 'Create, Bake, Grow & Gather' this week.